Dolce Blue are an original alternative band originating from the Perth hills, WA. They consist of four members, Veronica, Lachy, Brody and Daniel. Dolce Blue have recently been dabbling into the bar/pub scene, and for their efforts have spent the last couple of months playing at 2-4 venues a week including; Mojos, Badlands Bar, the Rosemount and Four5Nine, The Civic, The Aardvark, Indie Bar, Oceans 6019 and the Sewing Room. All this while working on their debut 13 track album titled "forever is too long" set to be released January 19th 2019. Listeners praise their sound and songs, being compared to the likes of Arctic Monkeys and the Black Keys. Their songs are "catchy", their solos "tasteful" and their energy "lively and fun". So be sure to catch their new album, or their live energy at one of their upcoming shows. 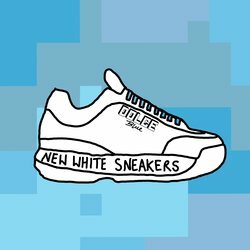 New White Sneakers is the debut single by Dolce Blue. It has the beats and bass to get you on you're feet, the guitar riffs to get you humming along, and that typical sad line " forever is too long without you".